When one of our (many) nieces turned 21, she exclaimed how much she loves champagne, while holding up a bottle of Asti Spumante. It was then that we, politely but firmly, explained in our best teacher voices, that Asti is not champagne by any stretch, and invited her and her boyfriend to our house at some point for champagne brunch. It took a year, but last week, the four of us had brunch, accompanied by an educational tasting of champagne ("real" champagne, from the champagne region of France) vs. cava (Spanish sparkling wine) vs. prosecco (Italian sparkling wine). (Asti was not invited). With our guests arriving at noon, we spent the morning cleaning up and getting our mise en place together so we wouldn't be stuck in the kitchen all day. We split the bagels and put them in a basket, and we mixed up a fruit salad of cantaloupe, green grapes, sliced strawberries and star fruit (photo above). We cooked the slab bacon and sweet Italian sausage and put those in the oven on low to stay warm. 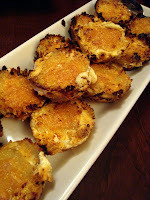 We made individual potato gratins (in a muffin tin) and allowed those to cool a bit. Then we got our ingredients together for the frittata. By the time they arrived, the table was set, the wines were chilled and all we had to do was cook the frittata - everything else was set to go. Preheat oven to 400 degrees. Grease the cups of a 12-muffin muffin tin. Layer each cup with slices of potato topped with salt, pepper and cheese. Continue to layer in this way until each muffin cup is full. Add two tablespoons of cream to each cup. Cover loosely with aluminum foil and bake for 20 minutes. Remove the foil and top each stack with the parmesan cheese, dividing evenly. Return to the oven and bake for an additional 20 minutes. Allow to cool before removing from pan. And by the way, their favorite "sparkler" happened to be our favorite, the real champagne, Veuve Clicquot. Lesson learned. You must be the coolest aunt and uncle in the state...What a great menu. Will have to try the recipe for individual potato gratins. Nice job. oh, what a luxurious breakfast you have offered! you had me gruyere....these look perfect for any buffet, breakfast, lunch or dinner!!! Can't wait to try them. Love you lesson, bet they love the tasting, you must be quite the aunt and uncle.